New Years Eve for me is somehow full of both a touch of sorrow at the reminder of how quickly time passes and full of hope for the fresh beginning the New Year offers. It’s also a time of reflection and when I look back at 2017, it’s not the endless meetings I’ve attended, places I’ve visited, awards I’ve won or reports I’ve read, but people that come to mind and some extraordinary acts of generosity and inspirational selflessness. 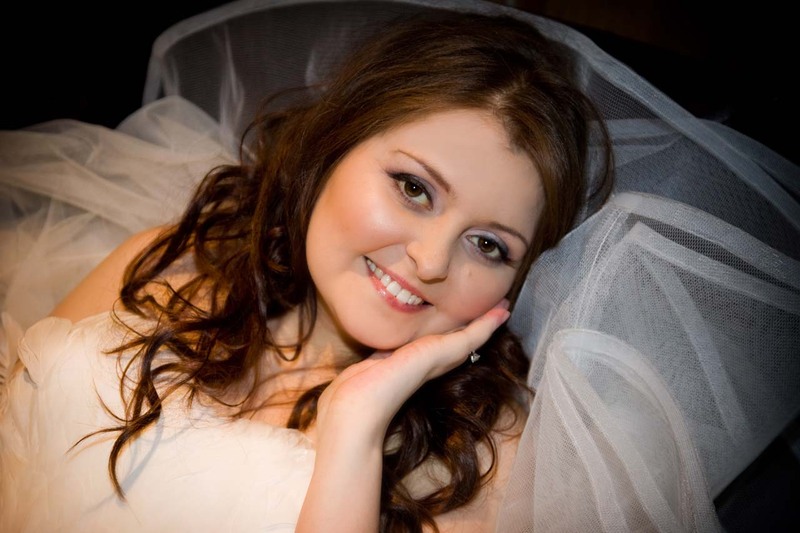 Jennifer, like so many other young bowel cancer patients, experienced a delayed diagnosis and so when she was eventually diagnosed it was already at stage 4. 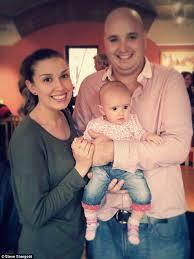 She had only just got married and was looking forward to starting a family. Her blog www.bodyassindex.com all too clearly documents the delight that was her and the awfulness that was her treatment. 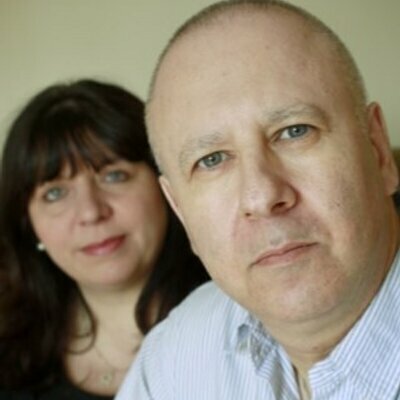 Another woman aged 49, who wants to remain anonymous currently, contacted me in October to tell me that she hadn’t been given long to live and to apologise that she wouldn’t be able to help Bowel Cancer UK in the way she had wanted. She had planned to become an awareness volunteer and to share her story to help ensure others do not have to endure all she is. Instead she pledged a £5,000 legacy to the charity on her death, which she had been informed would be in early 2018, to make up for her lack of volunteering support. 33 year old father of three, Sam Gould’s reaction to his stage 4 diagnosis in April was to make a film to help raise awareness of the disease. 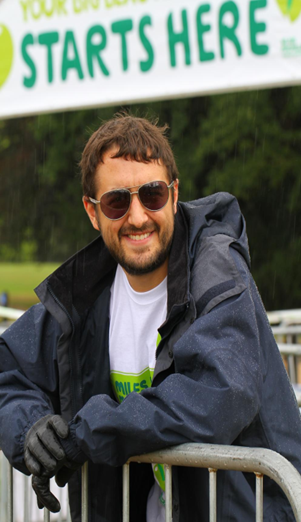 In those short final months of his life, Sam could not do enough to support Bowel Cancer UK using all his campaigning skill and zeal to publicise and raise funds for our Never Too Young campaign. His family and friends continue to support us which means so much to us all. It is these three remarkable people, and many others, I think about when I reflect on 2017. Their ability to consider and care about other people at the darkest moments of their own lives is I think inspirational and extraordinarily moving. 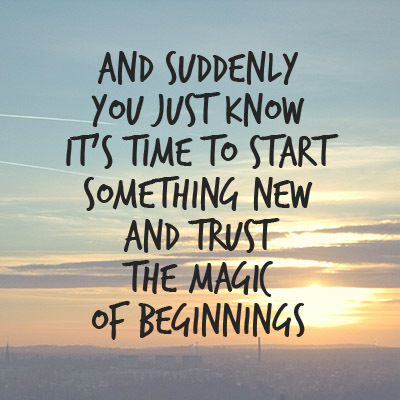 Of course New Year’s Eve also makes you look forward to new beginnings and this one feels particularly significant for me. On 01.01.2018 Bowel Cancer UK and Beating Bowel Cancer will be formally merged as one charity and I’m excited for the possibility that creates. Both charities achieve a great deal separately but we firmly believe that together we can achieve more. Together we are determined to save lives, improve the quality of life and provide support to everyone affected by bowel cancer. We will achieve this through an ambitious programme of research, support services, education and campaigns. I know 2018 will bring its fair share of challenges and frustrations for our new charity but with another 41,000 people currently unaware that 2018 will be defined for them by a bowel cancer diagnosis, the stakes are high. For them and for all those who have placed their trust and belief in us, we will not fail. Of course we can’t #STOPbowelcancer alone – we need people to be actively with us – could you make that your unbreakable New Year’s resolution? Mine is clear, I am going to give this my all. I’m going to breathe through the frustrations, calmly problem solve my way through the challenges and keep my sights strategically fixed on improving outcomes, so that one day we can look forward to a day when no one dies of bowel cancer. I’m ready 2018. Happy New Year, may it be full of hope, health and happiness. Woo hoo I did it! 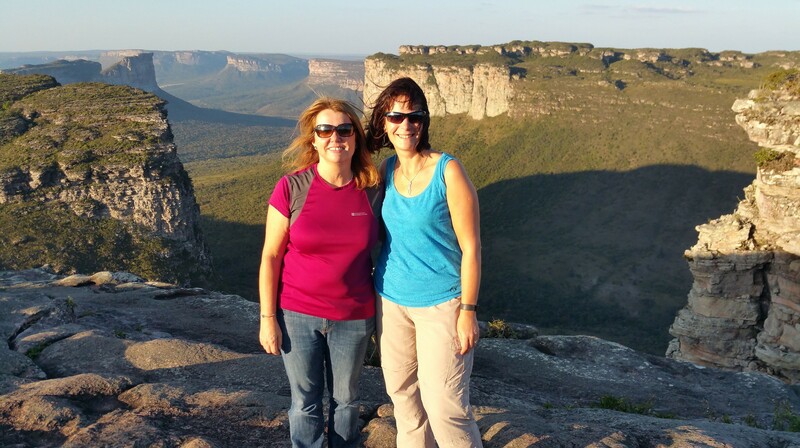 I successfully completed my trek in the Chapada Diamantina national park in Brazil with my dear friends Judith Vosper and Helen Taylor. It’s been quite an adventure so we are all feeling pretty chuffed! I left my blog rather abruptly, in part due to total communications blackout and in part because it was such a rich experience – a physical and mental challenge – that I needed to process the whole experience to be able to find the words to write about it. But where to begin? Whilst I was sponsored to push myself through a hike, actually that has been just one part of the challenging adventure I’ve been privileged to experience. I will try and explain. 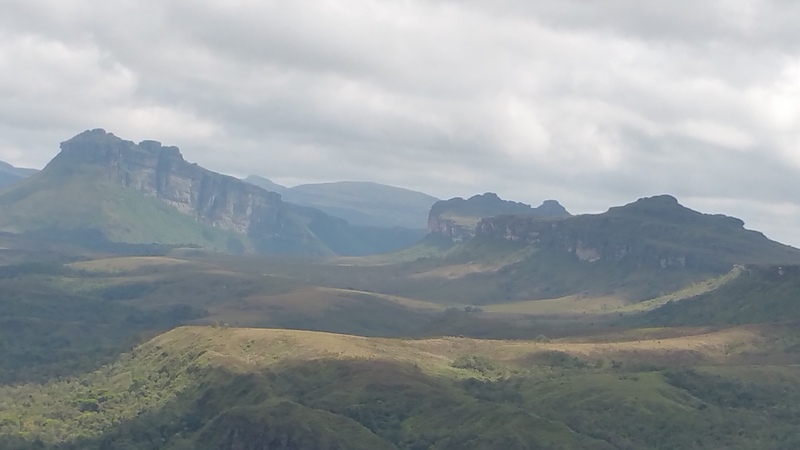 One of my favourite views from St Ignacio’s hill over the beautiful flat top mountains. 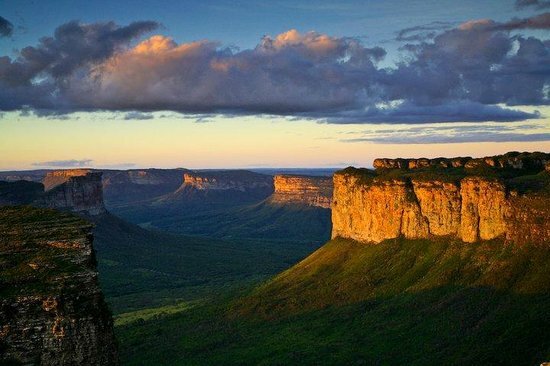 The Chapada Diamantina is one of the most beautiful places I’ve ever seen. 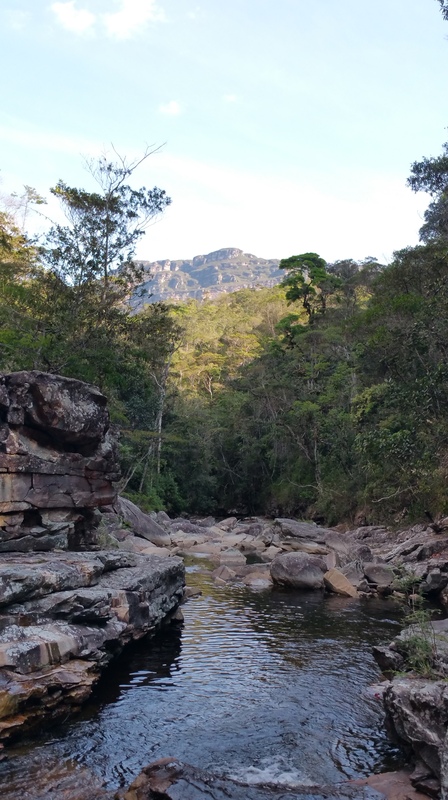 We were blessed to stay for much of our time in a very remote area of the national park, around 3 hours walk from the nearest town without access to mobile signal or even satellite phone connection. 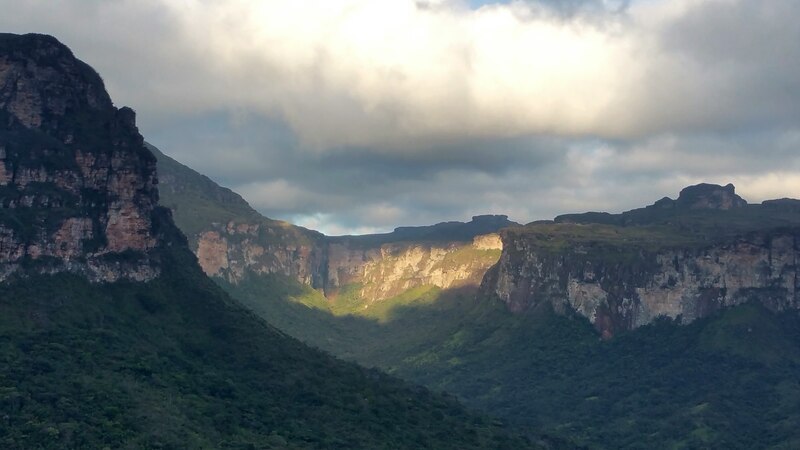 The area is famous for its history of diamond mining, flat top mountains and for a rich abundance of plants, flowers, butterflies, birds and even jaguars and armadillos we were told. It also has a varied array of bugs but more on that later! 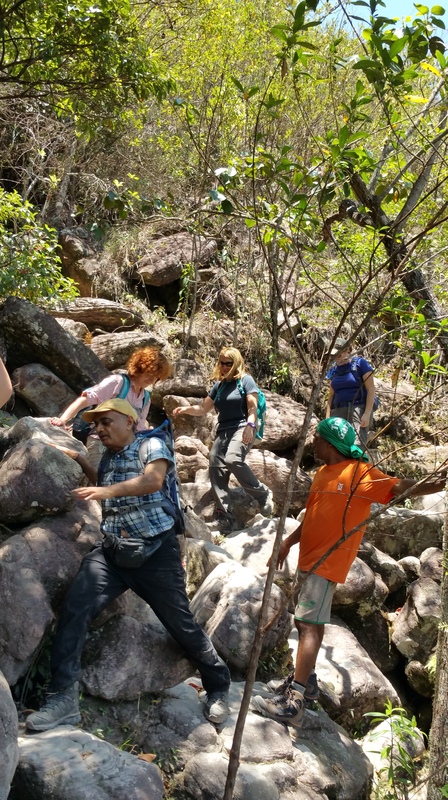 Our trek took us on paths through the valleys, including the glorious Patti Valley which is stunning and up and down those flat top mountains. 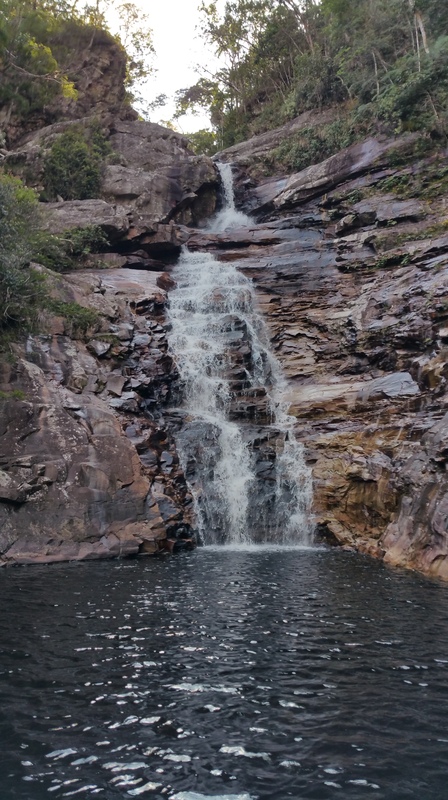 We regularly walked by streams and rivers and enjoyed the spectacular waterfalls and swimming in the many natural pools to cool off after a long trek. So pleased to find some shade at last! 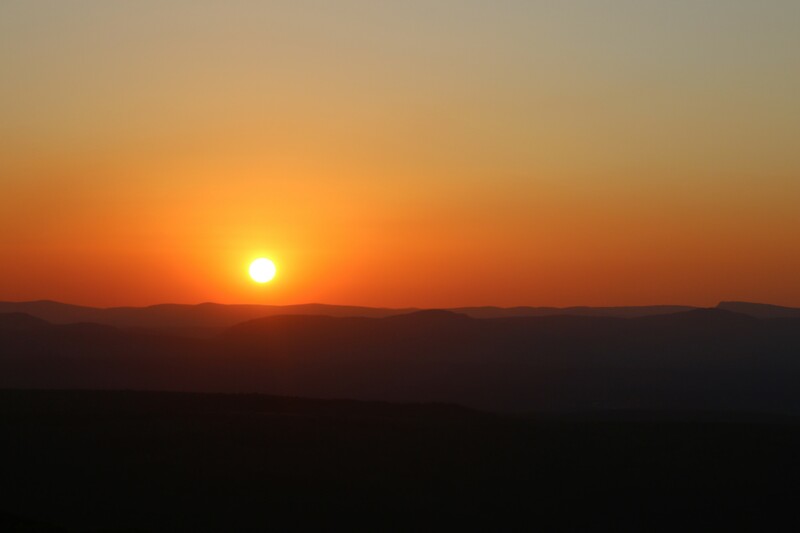 5.30am in the Chapada Diamantina – many mornings started like this. The only way down! A narrow ledge and a sheer drop was at the bottom. There were a number of big challenges on those long walks. Worse than distance covered or sharpness of incline was the heat. It was frequently in the 30s as we walked and all too often almost devoid of any shade. 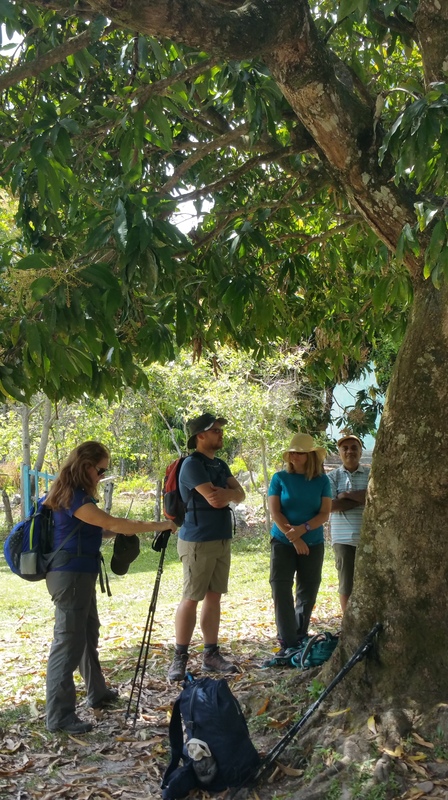 Our rest stops often included us all huddled together in any small patch of shade we could find or taking it in turns to take a break from the sun. Who’d have thought that sun lover me, would be so grateful for the overcast mornings when we tried to break the back of steep ascents. 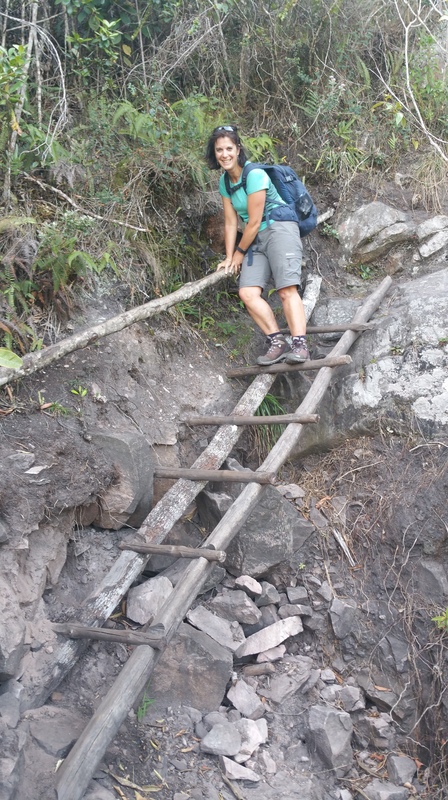 As well as getting a fierce reminder of the power of the sun so close to the equator, I also learnt a new trekking term – technical! 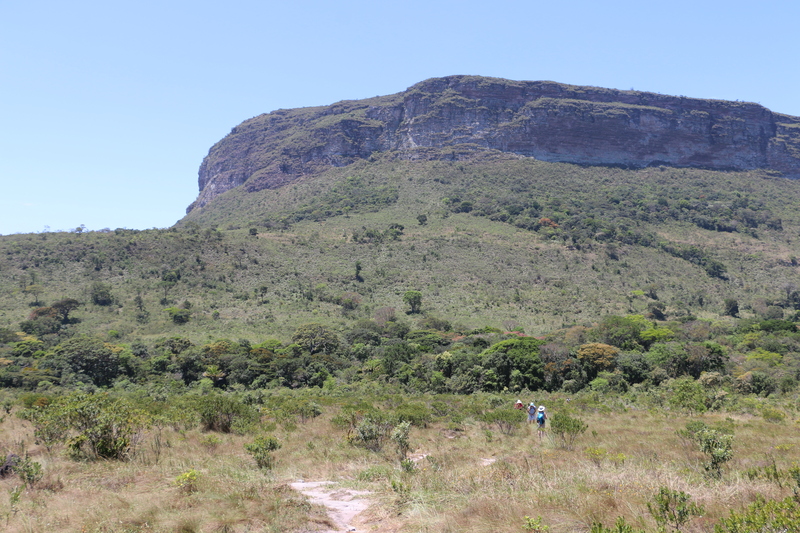 It appears that when applied to a days hike in the Chapada Diamantina it implies steep scrabbly ascents or scary almost vertical descents. 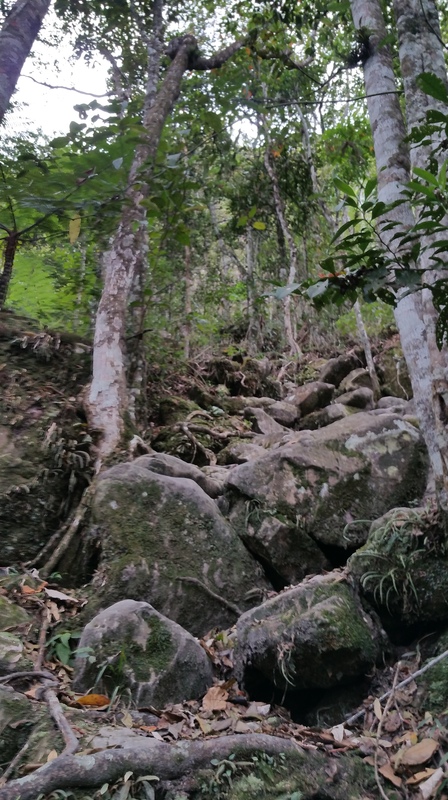 We were regularly climbing over rocks, stones, tree and plant roots on very steep slopes which required attention all the time or you risked a nasty fall. I’m grateful that my childlike grazed knees and legs are the only remaining proof of their challenge. Bizarrely I loved those bits the most – the sheer physicality and determination required to drag myself up and down those hillsides was a kind of therapy from my day to day existence of long commuting journeys on First Great Western! Completing them – even though every muscle in my legs ached – gave me a sense of achievement. 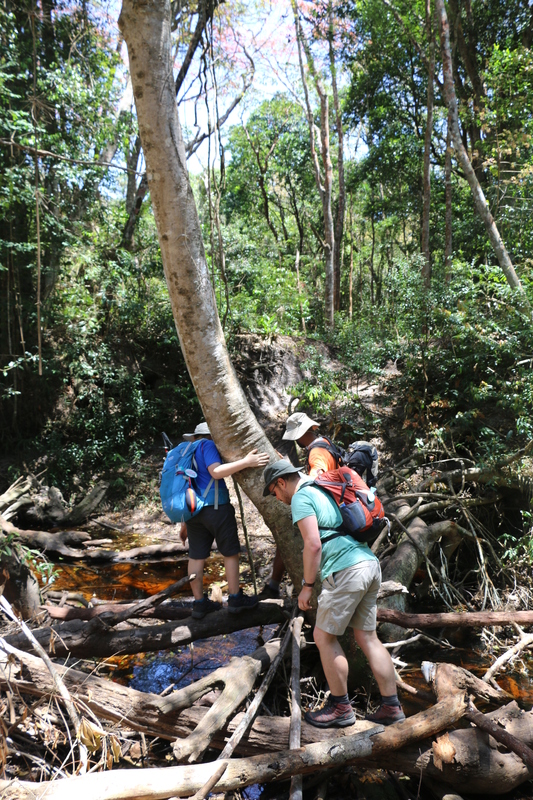 Perhaps the trekking day I enjoyed most was when we walked through the rain forest surrounded by fascinating plants and the wonderful calls of birds to accompany us. We saw hummingbirds, paraquets and all sorts of other birds with bright beautiful plumage. I would have liked to have quietly sat and watched and listened but the climb up and down was pretty tough and the schedule didn’t permit it. 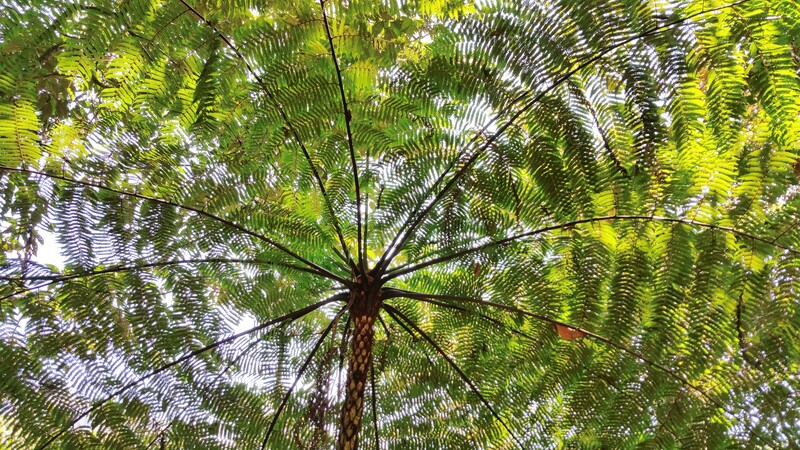 It was just glorious though to walk through the dappled light of the trees and majestic trees ferns with the loud interesting sounds from the forest all around us. That particular ascent included having to walk through a very dark cave which was definitely out of my comfort zone. With only head torches to guide us through the cave it was challenging and I was pleased when I finally scrabbled out through the narrow gap in the rock to continue up the hill to reach the top. Thankfully it was so worth it, as the view was amazing! The view after our long climb – awesome! 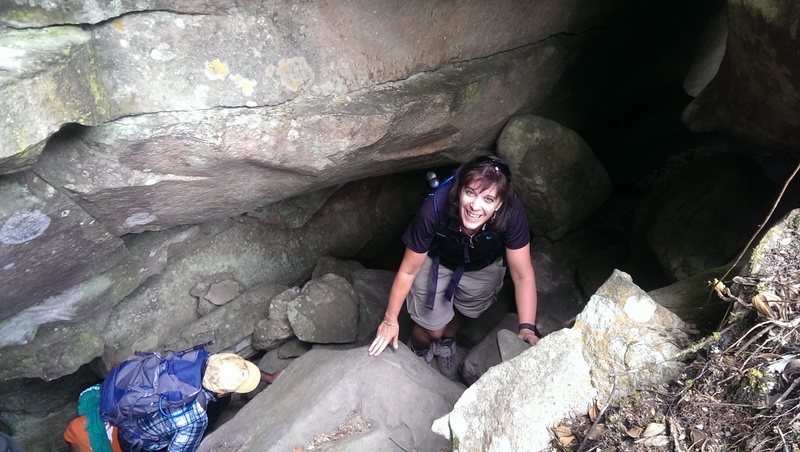 Me finally emerging from the cave – feeling pretty happy! Another day we walked for several hours up hill across the scorching top of a flat top mountain to the site of what should have been a spectacular waterfall. It was the only image I had googled before I visited and was truly excited to be seeing it. 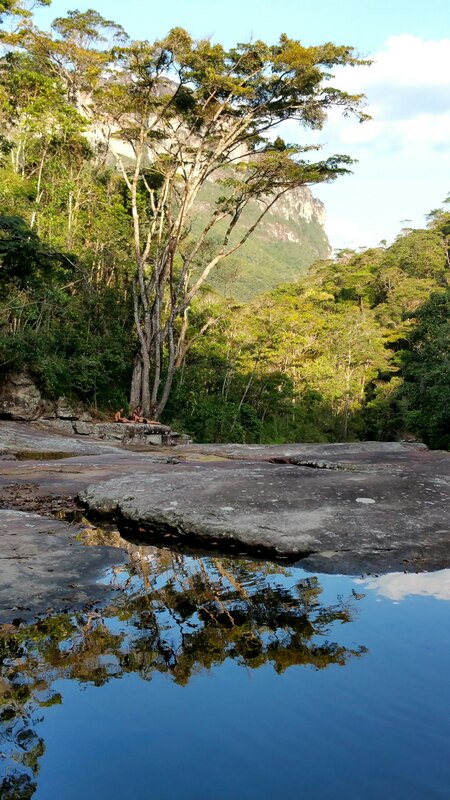 Unfortunately it was dry – it turns out I need to return in the wet season to see it flowing but the view was staggering anyway. 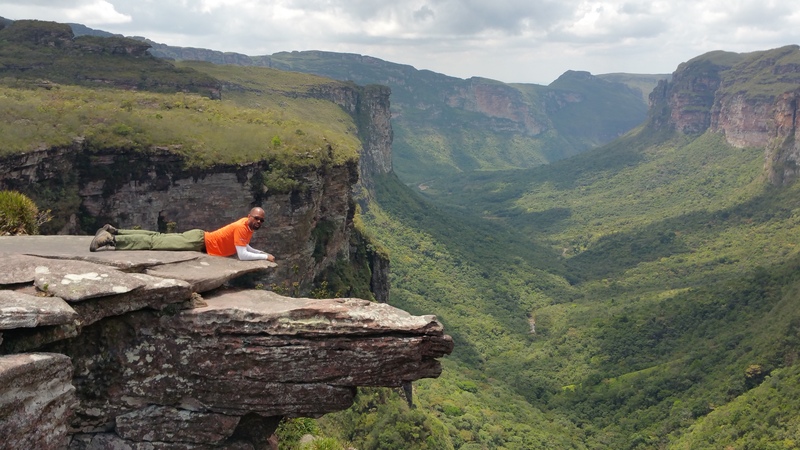 Tiago, our lead guide, checking out the staggering view but no waterfall! Bizarrely I also “enjoyed” the challenge of a particularly steep almost vertical descent one day over rocks and boulders and skirting narrow ledges with huge drops. I guess after a long and fairly dull ascent and walk across a hill, it was a welcome challenge and certainly got my endorphins flowing again. There had, in fact, been an option for some of the group to take an easier path down but sadly it was blocked by a fire (fairly frequent in the national park apparently) which swept over the hillside. It was pretty devastating to see the hillside so badly burnt and the path we had climbed down lost in the burnt ground when we passed by again a few days later. 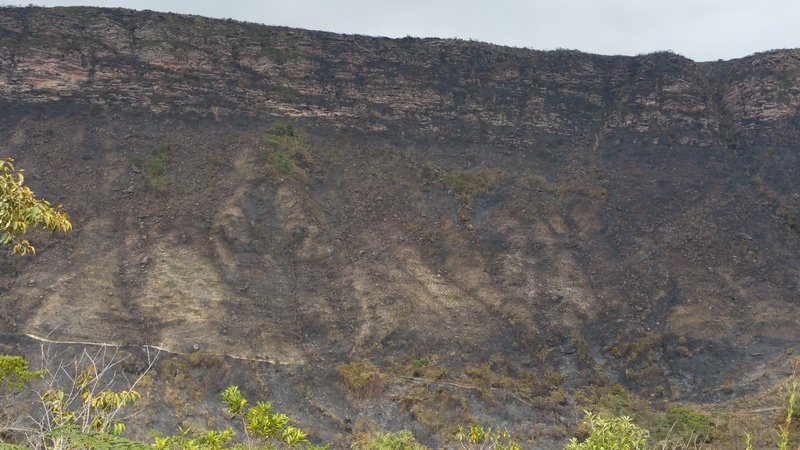 The scorched hillside post fire. We had walked pretty much straight down it just a couple of days before as the fire began to take hold. 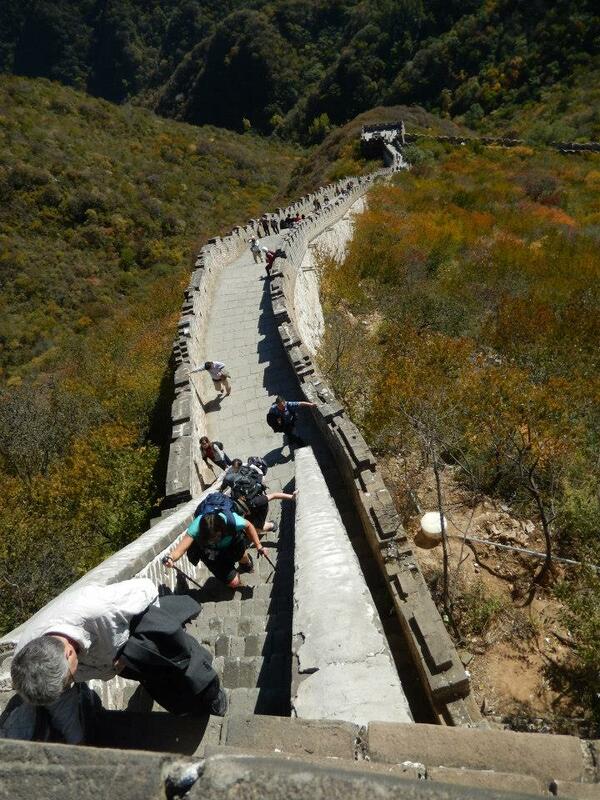 Many in the group found the treks pretty challenging, in part because of health issues. On day one my friend Helen had a serious problem with her eyes which was very worrying. She doesn’t have any known allergies but for some reason as we trekked through the valley her eyes became incredibly red and sore. She could barely see as she walked which was terribly distressing for her but by evening it had cleared a little. For the next few days it returned thankfully not so badly – but washing her eyes out with saline became part of our post trek routine. Another member of the group was stung by a hornet on her leg which then proceeded to swell badly. We were all terribly worried about it as the pain started to spread up her leg but eventually she found the stinger and pulled it out and that or the dose of her own antibiotics seemed to do the trick. As the satellite phone didn’t work at all and we didn’t have a doctor with us we were pretty fortunate my friend Helen is a very experienced nurse. Definitely something for the trekking company to address for such a remote trek in the future as the risks – simply due to the nature of some of the walks – are considerable. I was lucky compared to others as I simply developed a stinking cold in the first couple of days and spent 10 days sneezing, coughing and not sleeping well and of course ended up infecting others in the group (so so sorry). A cold is hardly something to moan about but on this occasion it certainly added to the challenge. The lack of sleep also probably contributed to me picking up another bug post trek during our stay in Salvador and Rio. I felt great on my last day though! I have to admit, I find sharing a room at night with anyone other than my husband (and children at a push), a challenge. 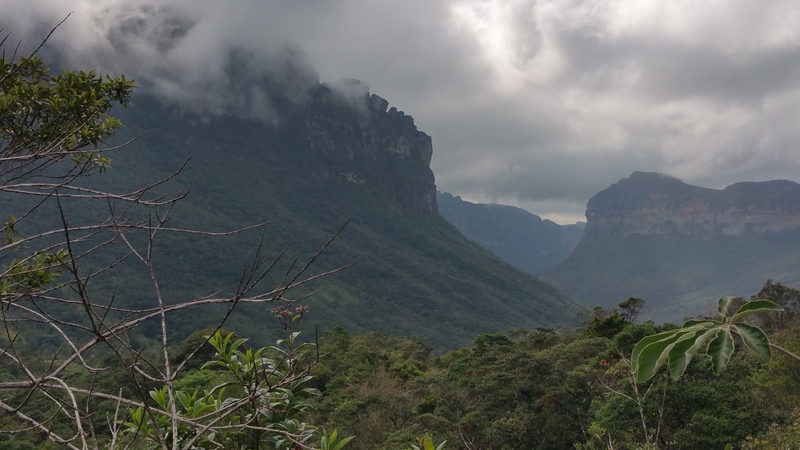 We did stay in a couple of very pleasant hotels in Salvador and Lencois on arrival and in interesting Capao (a place I’d love to explore more) but as we moved deeper into the national park it all got much much more basic! 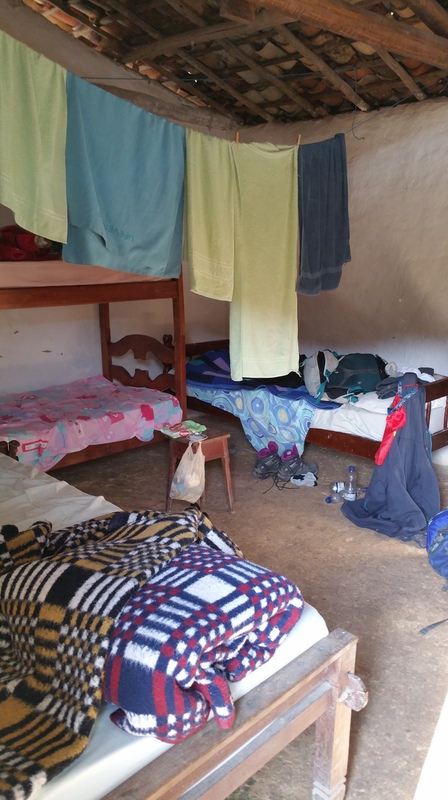 In our first home stay, five of us were sharing a room – along with a host of mosquitoes and other more ‘interesting’ bugs thanks to the ventilation created by the lack of join between the ceiling and floor in many places! One memorable night, Helen, Judith and I cried with laughter and horror as we tried to work out how to rid ourselves of a particularly nasty looking creature crawling around our bedroom walls. Oh how I missed my husband that night! 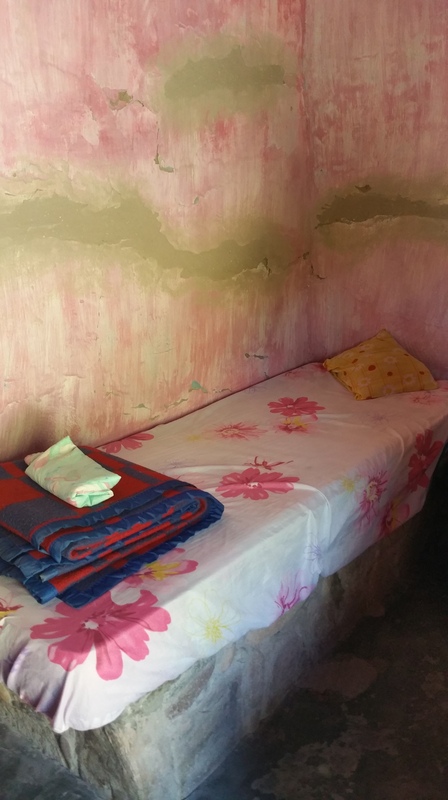 We spent three nights in that first home stay and far too much of mine was spent lying awake, sniffling, sneezing and coughing, listening to the others sleep and feeling desperate to join them. In moments of desperation I’d quietly leave the room and watch the changing shapes of the stars – beautifully clear and unblighted by any light pollution. I’ve rarely seen the Milky Way more clearly than in the Chapada Diamantina during my solitary middle of the night star gazing trips and I’m glad to have seen that. Our second homestead, also the most beautiful setting amongst the hills, was again without any electricity in the rooms and was also devoid of a fully working toilet! Thankfully it was only the clean water that sprayed out all over the bathroom when flushed and we went to “sleep” worrying we would hear screams during the night as it finally collapsed totally over some poor fellow trekker. In fact if wasn’t the toilet fears or concrete beds that woke me in the middle of the night, rather it was the scuttling of a cockroach close to my head, followed by a cockerel starting its morning calls outside our window at 1.30am….aaaarrrrggghhh. After a week of serious sleep deprivation that cockerel was the final straw as we were due up at 3.50am to start a long steep ascent before the sunrise when it was cooler. To be honest none of it bothered me much – I saw it all as part of the challenge I’d taken on but I know others found it quite hard. Treks and accommodation like that are definitely not for everyone and there’s no shame in that. I just felt blessed to be there and the dirt, bugs and challenging sleeping arrangements just made the ‘highs’ that much richer and sharper somehow. Who’d have thought I’d feel like that but I’ve found that when you are doing something for a reason – for me to raise funds to help save lives – most adversity can be overcome. 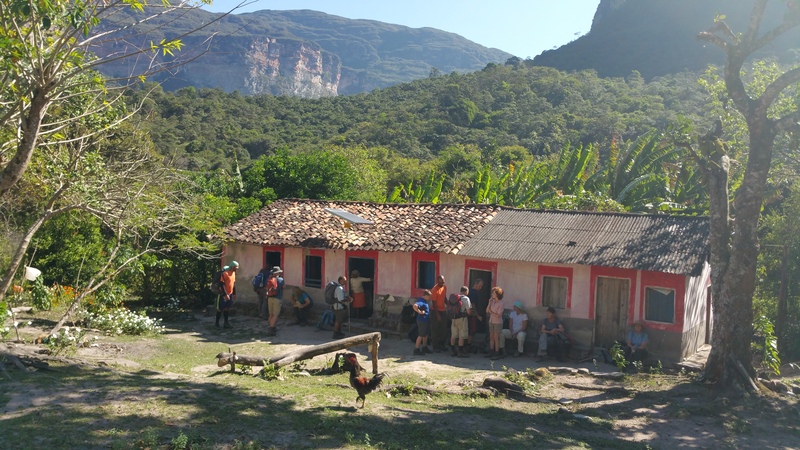 Despite the challenges of our sleeping quarters and itchiness of our mosquito bites we were blessed with some great food at all our accommodation – lots of traditional beans and rice but also wonderful vegetables, fruit and cake. At homestead 1, we also had the very best coffee any of us had ever drunk. It was grown, harvested and dried right there on the farm. I wish I could have brought some home. My brilliant trekking group with porters and local guides. I’m one of those people who as I’ve got older has come to enjoy some quiet solitary time – perhaps because my work involves lots of lovely contact with people. I have come to love walking at home in the Cotswolds with just my dog so I can really soak up the beauty of my surroundings and rebalance. Therefore, long days with 14 others (including the local crew) without a place to hide away was always going to be a challenge for me and I suspect for many others as, inevitably, everyone went through highs and lows. Yet I felt so fortunate to be with these wonderful people, it was a fantastic group. 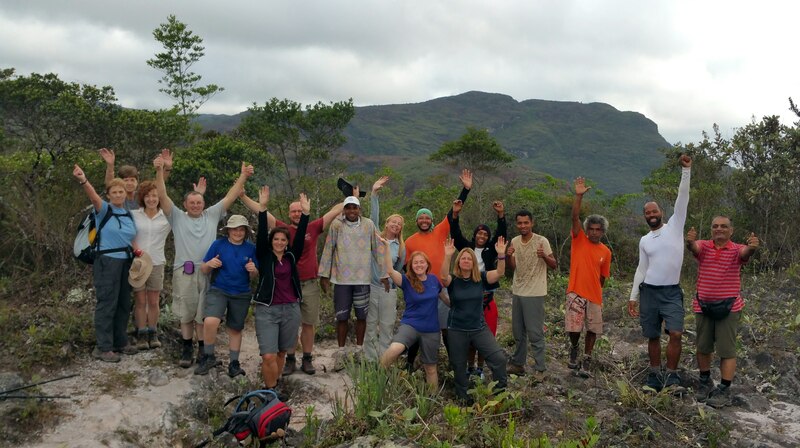 It was made up of lots of very experienced trekkers – all totally up for pioneering this new trek for Discover Adventure, our trekking company. All without competition or any type of malice – just support and a great deal of laughter. Eventually, I found my quiet ‘happy head’ time by taking endless photographs. I developed a technique of walking at or near the front of the group so I could drop back to take my pics as I tried to capture the beauty of the place and could then catch back up again so not holding anyone up. I was interested in the therapy it gave me as it made me really look at my surrounding and take in the changing light, the amazing views, the glorious plants as I tried to find the perfect picture angle. David Bailey I certainly am not, but taking the photos and reviewing them gave me lots of quiet pleasure. 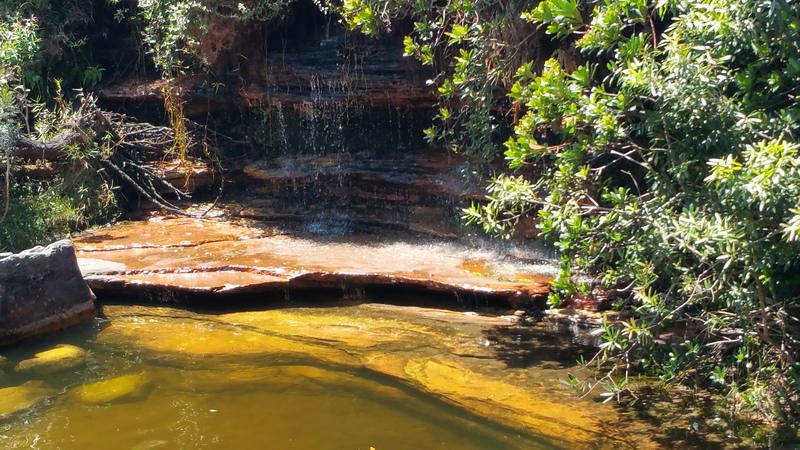 I totally loved the reflections in the streams and pools we passed. I think many of the group missed their family and friends at points. I found leaving mine incredibly tough as I know did my friend Judith. At the end of the trek the tears fell when my first message from home brought me the news that my little girl had fallen over a wall and badly hurt her nose and face and had to be taken to hospital to be checked out. She’s fine but I felt such dreadful guilt not being there for her or being able to take my younger son to visit some universities or help him resolve his uneasiness about universities and course choices he has been feeling. Of course it will all be fine and I was there for a reason but it all adds to the challenge. Yet despite the challenges or perhaps because of them, overall I loved it. It’s definitely been much tougher than China but I feel pretty proud that I can face my fears and take on and conquer a challenge like this. Best of all I have laughed a lot, been blessed to visit a truly amazing place and come out with incredible memories which will stay with me always. 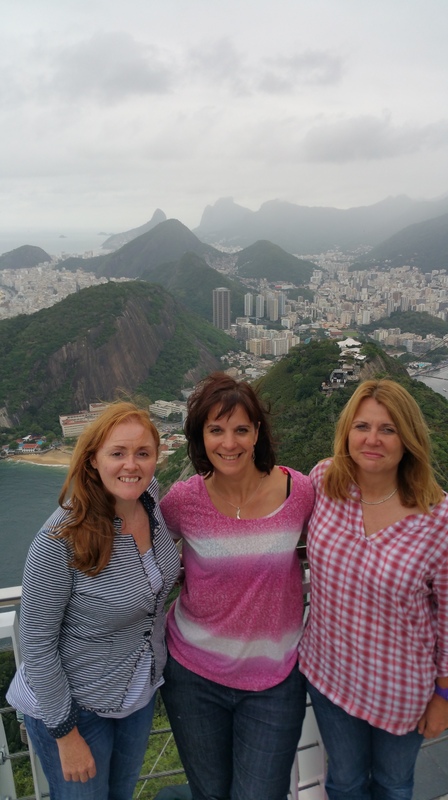 With my lovely friends, Helen and Judith finally in Rio. I’m not adverse to taking on other challenges for Bowel Cancer UK if it helps but I’m going to take a break from fundraising for a while as this undoubtedly is the worst aspect by far of any challenge. People have been so generous but I know are fed up with my sponsorship requests and I simply don’t have time to organise events or have access to a rich list address book (although I’m trying to change that!). Over these last challenges I’ve raised through sponsorship and gifts in kind around £30k which isn’t too bad but I’d still like to reach £50k eventually. Best of all, lots of other people have joined me and taken on a fundraising challenge for us as well and that’s awesome. I am truly grateful for everyone’s support because it’s only together that we will finally stop bowel cancer. So just one last request…. If you can please sponsor me – the page will be open for a bit longer. Thank you. #WeHaveGuts #IHaveGuts Thank you for your support. Thank you for your support. We all truly appreciate it. After a pretty much sleep free night Judith, Helen and I met at 3am at Heathrow along with our trek leader Phil and the rest of our trekking group. After what felt like never ending hours of waiting around or flying later (London – Lisbon, Lisbon – Salvador), we finally arrived in Brazil. After 24 hours of only a bit of plane sleep I was pretty excited to finally arrive at our first hotel. We had some time to freshen up then went out for a delicious dinner and had our first briefing about the trek. It’s a nice size group only 12 of us including Phil and there are many very experienced Trekkers amongst them but all seemingly chilled and uncompetitive. Phew! The first morning we left at 8am for a tour around Salvador. Whilst Helen, Judith and I were keen to get going actually it was a good beginning, as we are all still pretty shattered from the travelling. 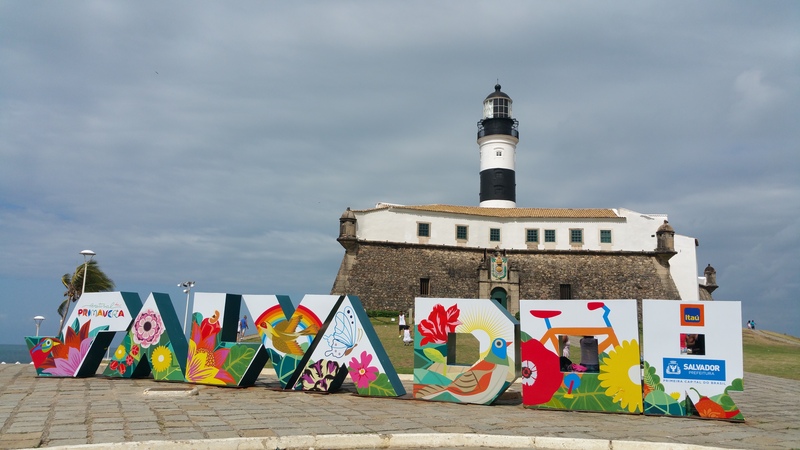 Salvador is the third largest city in Brazil and was its capital for many years. It’s right on the coast and is on two levels – upper town has the old historic centre and is more residential, and lower town is more of the commercial centre but as we drove past clearly has a lot of houses too. We drove to the lighthouse on the seafront and had a chance to walk around the historic old town. I really like the multi-coloured buildings and cobbled streets. 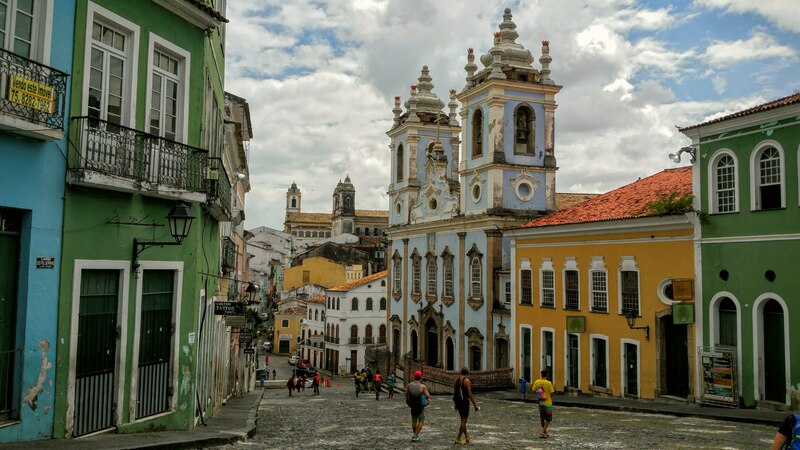 It reminded me of Havana – similar style buildings and lively vibe with people out in the streets and lots of music blasting out of bars and town squares. 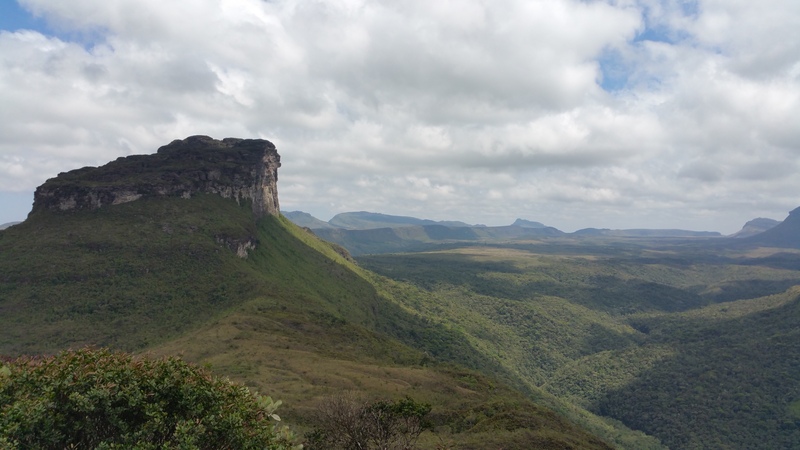 In the afternoon we took our third flight to Lencois which is the gateway town to the Chapada Diamantina. It’s in the middle of nowhere – perfect – and we were all super excited to finally be here. We were warmly greeted by our trekking guide Tiago – another super cool Discover Adventure local staff member whose English is excellent. We were all immediately impressed. 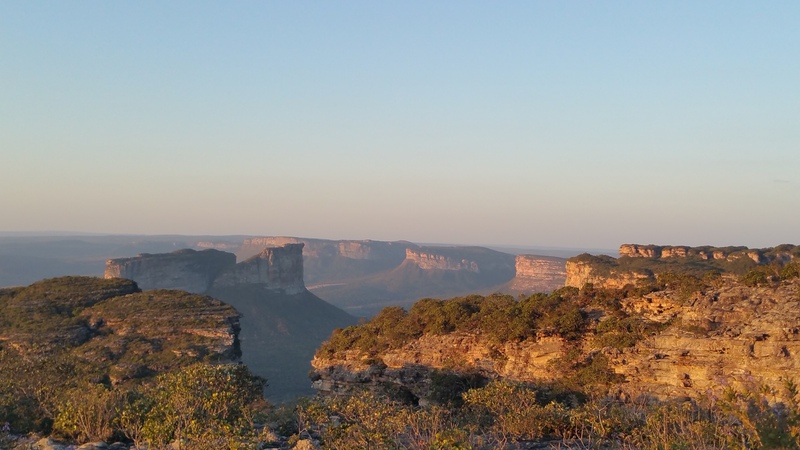 Straight away we drove to the edge of the Chapada Diamantina for a short walk up Father Ignacio’s hill. 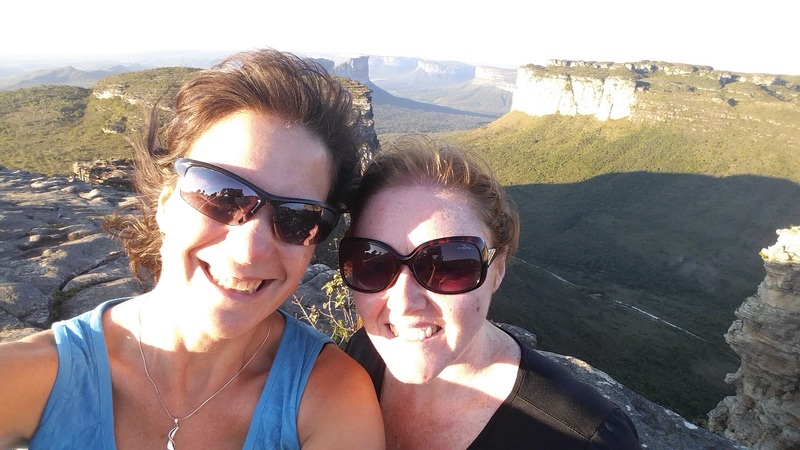 It’s a short walk and a scramble up rocks but oh my goodness the views were breathtaking. I have so been waiting for that view! Even better we were able to watch the sunset which was spectacular. 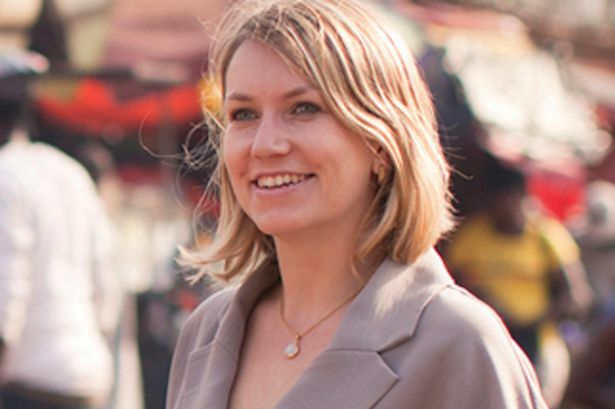 All the tiredness melted away – I felt energised, excited and ready for the challenge ahead. The day ended with a lunar eclipse… Wow! The jetlag remains and I’m up early – 6am – and am delighted to be greeted by sunshine and incredible birdsong and glimpses of red and yellow plumage. I feel so blessed to be here and experience this – even the nerves and tiredness. So many of my patient buddies would love it here. Somehow knowing that makes the whole experience more precious and intense. I will do this for them because bowel cancer is a cruel indiscriminate disease and it’s time it was stopped for good. So if you can please help by sponsoring Helen, Judith and me to fund bowel cancer research so we can find ways of identifying bowel cancer earlier when it’s most treatable. It truly will help us save lives. 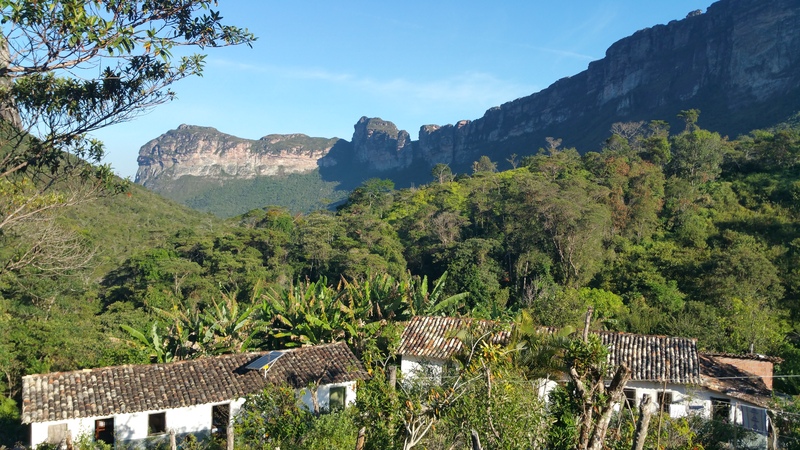 We leave Lencois today and will have our first full day of trekking in the Chapada Diamantina. We are so ready. Bring it on! Click here for our JustGiving page. Wow! In just a few hours I’m heading to Heathrow and meeting my trekking group at 3am for our 6am flight. That’s actually quite scary! 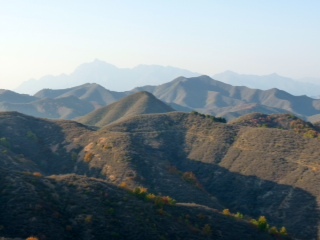 I had naively thought this trek would be a smoother build up than it was for China – that my nerves would be less, that my training would be easier, that I’d manage my long to do list better but actually – a bit like having a second baby – it’s not been easier, just different. There have been a new set of challenges to tackle these last few months. I mean who’d have thought my lovely comfortable walking boots would decide to start to hurt for the first time, just five weeks from departure. Or that after finally realizing there was no remedy that I’d only have two weeks to break in a new pair. Well that’s certainly upped my trek adrenalin levels but whilst not 100% worn in, the bottom of my toes are no longer blistering so that’s a definite win! Of course I will be fine – it’s simply a long walk after all. I will do what I can before I leave and the rest will just have to wait. The world won’t end if I don’t clear my to do list or if I forget my toothbrush – there are normally solutions. Everything falls into perspective somehow when you work in and live around cancer. After a period of relative stability, it’s been a tough few weeks with various patient friends struggling with recurrences, complications, side effects and terrible news that the cancer is now incurable. That, of course, is why I’m going – to show my solidarity, to take action, to do something practical to try and raise funds for research to improve the early diagnosis of bowel cancer so these tragic experiences stop once and for all. After all 9 out of 10 people survive bowel cancer if it is diagnosed at its earliest stage but currently only 1 in 10 are diagnosed then. Far more – over 60% – are diagnosed when there is at least local spread into the lymphatic system or with a secondary tumour. That makes treatment so much tougher and the odds significantly worse. It’s also why Bowel Cancer UK’s new research programme will focus on identifying the highest risk groups and look for better ways of preventing and detecting bowel cancer early. But this requires money and so that’s why I’m happy to go way out of my comfort zone, control my nerves and fly to Brazil to take on this amazing challenge. 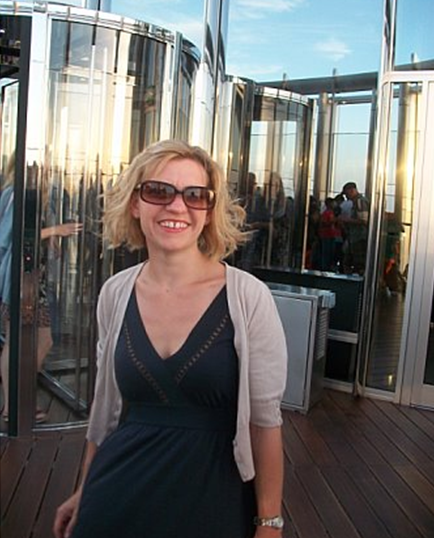 If you are still not sure why you should sponsor me and help Bowel Cancer UK – this blog from lovely Gina Shergold, whose husband Steve was diagnosed at the age of 30 and is now only 33, should explain it better than I ever can. I’m going to try and keep this one relatively short because I don’t think my brain can handle too much more right now. The last time I wrote, we were waiting for a CT scan and the for the new trial treatment to start. For the past 6(ish) weeks, we’ve been going into hospital regularly for blood tests, consent forms and so on to get Steve up and running on the trial, and on Thursday last week he had a physical exam to make sure he was well enough and showing no sign of infection etc, with a view to him starting the trial this week. On Thursday afternoon, we had a call to say that it turns out the trial had been closed for a while and that Steve could no longer participate. They asked us to come in today to discuss other options. So today, we went in for a meeting with the oncologist and were hoping he would have news on a different trial. Instead, he told us that there is currently nothing available, and that we are now dealing with a “terminal illness” – incurable. We are absolutely devastated, shocked beyond belief and heartbroken. We also learnt that his spine has got in on the cancer action, and more than likely his liver, too, although that part isn’t confirmed yet. They will keep looking out for trials, and as soon as one comes up that Steve is eligible for, we will be informed and he’ll be put forward for it (provided he wants to be). Steve has slept for most of today through sheer exhaustion. I feel numb to the point where I can’t feel my feet on the ground, but at the same time, I’m in more pain than I’ve ever experienced in my life. I don’t really know how I’m still standing at the moment but we both agree that we will not give up, we will keep fighting and live every day to the fullest for our baby girl and for each other. Sorry it’s a short, blunt and pretty rubbish one, but I wanted to keep everyone updated. I’ll write again when I have more information and/or when my head is feeling a bit less fuzzy. We have to stop this. 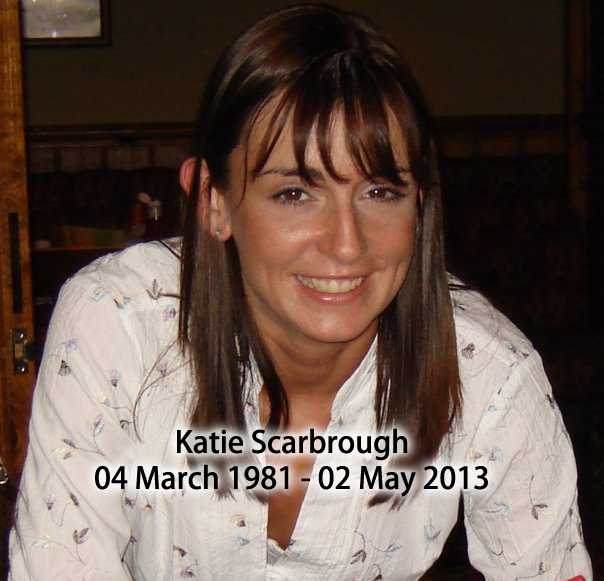 We have to stop the pain and anguish bowel cancer causes. We have to stop people dying and WE CAN – but we need money to invest in research, to raise awareness, to campaign for best treatment and care across the UK. We need your help. 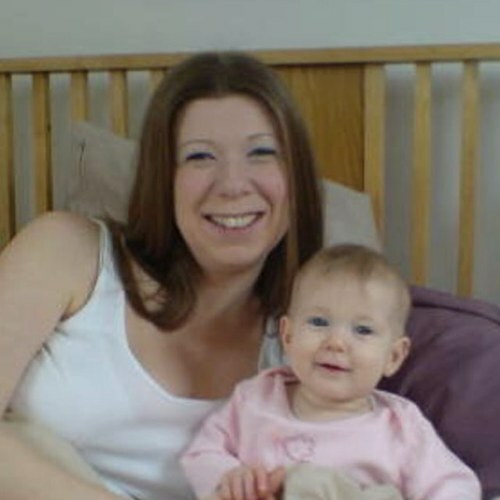 This is going to be my last fundraising challenge for a while – as I can feel the fatigue with my endless quest for sponsorship – but if you could sponsor me, just one last time – for Gina, Steve and baby Esmee – for everyone affected by this awful disease, it would be awesome. I’ve definitely lost the plot this time. I’m climbing up onto the roof of the 02 arena today. I mean really – I’m 46 years old and didn’t dream of doing this kind of stuff even when I was 26. I’m not sure what worries me most – the fact that I get horrifically dizzy looking up (weird) or the dreaded boiler suit (wish I’d started my diet earlier – I know outrageous vanity!). But how could I not take part, when awesome charity supporter Clare Madden is taking on this challenge to raise funds and awareness because her Mum was recently diagnosed with advanced bowel cancer and our lovely patron Michael Pattemore is also prepared to take on the challenge in memory of his wife, Lynda Bellingham. Bless them both. 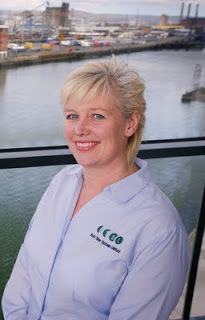 It’s almost exactly six years ago that I became CEO of Bowel Cancer UK and I’m as passionate and committed now to saving lives from bowel cancer as I was then. 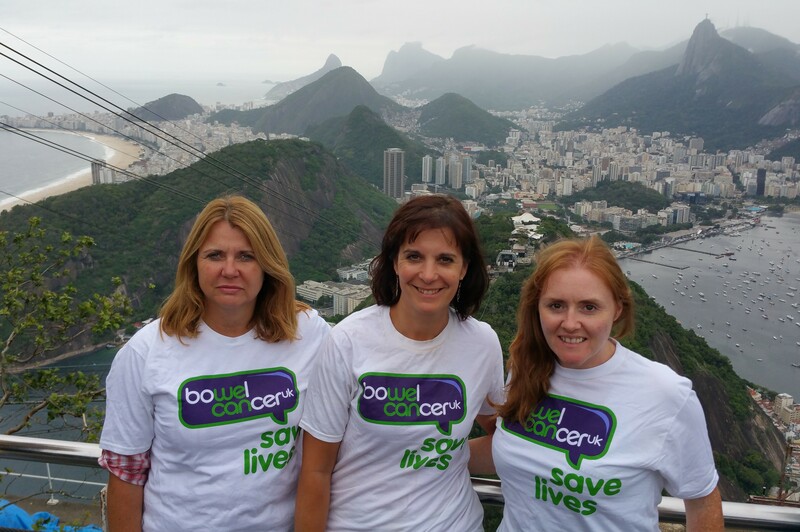 It’s been a tumultuous six years – full of amazing highs and some rotten lows but I feel so proud of my colleagues at Bowel Cancer UK because as a team we are doing some brilliant work and we know we are making positive change happen. But I’m not happy yet. I want us to do more – I want us to Stop bowel cancer for good. I am genuinely moved and humbled by the things people, who are often closely affected by bowel cancer, do to support Bowel Cancer UK and so I feel I must also push myself, go out of my comfort zone and in solidarity join them in raising funds so the charity can have even more impact. 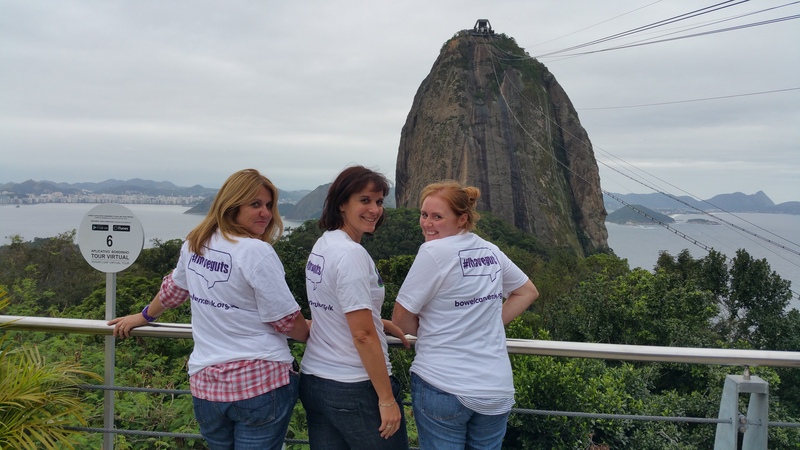 So over the next few months I am taking on 3 challenges, climbing the 02 Dome today, a 20k London Bridges Walk in September and another trek from the 26th September – apparently tougher than the Great Wall challenge – this time in Brazil. …Because it is all about people including all these dear friends who we have so tragically lost. Whilst we know that bowel cancer can be cured and early diagnosis is the key, what it more difficult is detecting people early. Symptoms can be vague, the current screening test too blunt (which is why we must move to Faecal Immunochemical Testing in all 4 UK nations ASAP) and patient and clinical delays lead to poorer outcomes. We also don’t know enough about who is most at risk – we know about some broad groups – people with known genetic conditions such as HNPCC or Lynch Syndrome or Familial adenomatous polyposis, people with a strong family history or who have had an inflammatory bowel disease (IBD) for over ten years but we don’t know exactly who amongst those groups will develop bowel cancer. Many people at high risk present young hence why we’ve been talking about them a lot as part of our Never Too Young campaign but it cross cuts age. If we could get better at identifying people with increased familial risk for example or who with an IBD might develop bowel cancer then we could ensure they are effectively screened so it is prevented or diagnosed early. It’s research linked to solving big issues like these, that I am fundraising for. We hope to launch our first grants round in 2016 themed around issues related to Never Too Young. However, we need to raise funds to make this happen, so I’m fundraising again. It would be simply awesome if you could sponsor me or take on a challenge yourself, or hold a coffee morning or just ask your friends to donate. If we join together and take action, I genuinely believe, in time, we will Stop Bowel Cancer. And for that hope, today, I will happily don the dreaded boiler suit and harnesses and conquer that dome! So I’ve been back from China for almost a week and my brain is finally beginning to feel less addled by jetlag and the hour change and it’s certainly good to be home. My daughter is delighted by her panda bear toy so all is well and I’m almost forgiven for going! 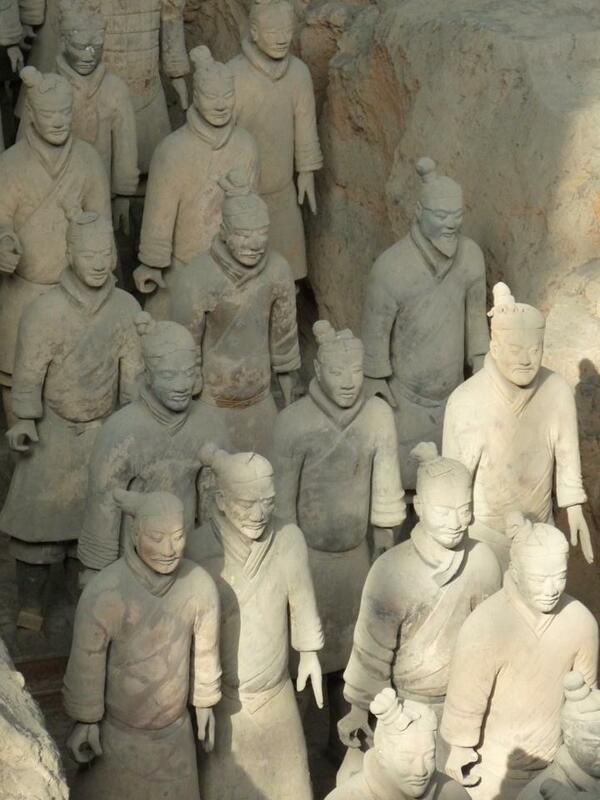 I left my blog rather abruptly to go off to a celebration meal on completing the trek and then took to the tourist trail, spending a couple of days in both Beijing and Xi’an where I visited the Terracotta Army, inspired, as I mentioned in an earlier post, by my patient friend Gail. 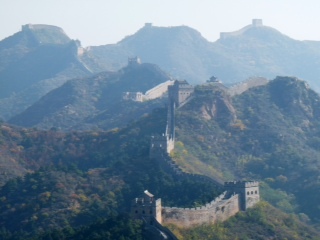 I’m pleased I spent the extra days as it gave me a greater insight into China and its contrasts. It truly is a fascinating country and culture. It’s also given me time to reflect on the trek. I freely admit I was terrified before going – of failure I guess and my lack of time for preparation definitely didn’t help. My lovely husband stoically put up with the tears and traumas and thankfully once I was at the airport I began to feel calmer and embraced the challenge more positively. That’s me in green! That was seriously steep. I realise that must sound pretty pathetic but as I noted back in August, I’ve a had a mild phobia of physical challenges since my school days and my life is a bit mad after all, juggling a full on job, long commutes and my most important role as a Mum. I guess taking on the trek reminded me what a fine tightrope I walk in my day to day life. So who would have thought that today I would be able to say I loved it. In fact, I loved every moment of it – even the really challenging bits. My lovely bowel cancer survivor friend Fiona was a particular star in the run up, helping me to fundraise by personally donating, baking cakes to sell and doing an office collection. She predicted the challenge I felt would make it more worthwhile in this picture she sent to me. I held onto that thought before I went. Thank you Fiona, you were right! So what was so great about it? Well it proved yet again that if I dig deep and hold my nerve I can extend my comfort zone and it does make the achievement sweeter. I wasn’t sure I could manage the steep climbs but thanks to will power and focus I did and the views were an awesome reward. In some places the mountains seemed to go on forever and the sheer scale and beauty of our surroundings was inspiring. I’m now determined to hold onto the feeling of an endorphin fuelled buzz after a tough physical challenge and try and incorporate it into my normal life. I’m not great at ‘me time’ but I am now hoping to join a local trekking group in the Cotswolds as I think the benefits to my physical and mental health outweigh the downsides of time away from home. I am even seriously thinking about doing another trek – I didn’t predict that I would catch that particular bug! I think it was also great because whilst I didn’t raise as much money as I originally hoped (but I’m still working on that) I did raise some new funds for the charity and we’ve benefitted from some extra media coverage, which all helps to raise awareness. I’ve also felt blessed by the tremendous support I’ve had from my friends, family, colleagues and my lovely online buddies. So many people have been incredibly generous with their support and a few have even given multiple donations and I have found that humbling. Thank you so much to everyone who has donated. At a time when so many of my patient friends are having a tough time, going through gruelling treatment, the fact that they still took time to cheer me on across the twittersphere was incredible. I definitely carried thoughts of them and many we have lost, throughout the trek. Of course whilst I was away there was the sad news about the death of Lynda Bellingham. Yet another reminder that there is much to be done and why Bowel Cancer UK’ s Time for Guts campaign is so important. People continue to die needlessly and I firmly believe its time it stopped. I hope more than anything that my trek will encourage others to take action too and help us raise further funds and awareness because after all, no one individual or organisation can make the change we need but together we can. 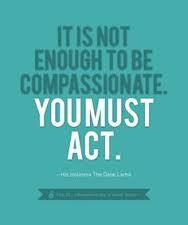 If bowel cancer has affected you or someone you love please don’t be a bystander, take action, get involved. With focus and determination, together we really can save lives. I hope you have enjoyed the pics and of course it’s still not too late to donate! or Text GUTS72 £5 or £10 to 70070. I’ve fitted everything I could into my 60 litre holdall and if I’ve forgotten something, tough – I will just have to manage. 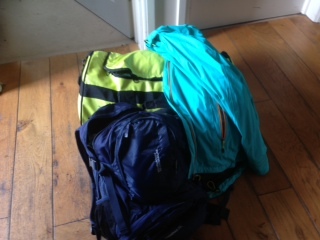 More likely, knowing me, I’ve fitted in too much and the holdall should have been smaller! It’s not been particularly easy getting to this point – sometimes it’s been a negative tipping point on my stress levels as I’ve struggled to fit in enough training with my long working/commuting days (often 7am – 9pm) and being a Mum, but the good news is I’m definitely fitter than I was. Walking with my dog in the stunning Cotswolds countryside has undoubtedly been a tiring delight. The beauty of it all has made my heart sing, yet at the same time I’ve not lost sight of why I’m doing this. 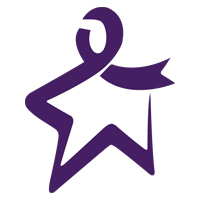 I’ve had a lot of time to think about all those affected by advanced bowel cancer and I’ve grieved for those we’ve lost during this time and those we are losing – there’s been a lot of bad news of late in my circle of patient friends. Ultimately my sorrow for them and their families has served to strengthen my resolve. I’ve also had time to think about/mull over some of the big challenges about advanced bowel cancer and to look for solutions. Greater awareness amongst the public and primary care professionals and increased uptake of screening is clearly critical, as is better surveillance screening of high risk groups so we detect cancers earlier. However, we must also address variations in treatment and care around the UK. Better advanced multi-disciplinary team working and access to high quality liver surgery are just two examples of things we could improve relatively easily. And that’s why I’m going to China – people are dying every day and others are being denied access to a possible cure and I think it’s time that stopped. I hope this trek can help raise awareness and funds so Bowel Cancer UK can lead the change needed to improve treatment and care of people with advanced bowel cancer. 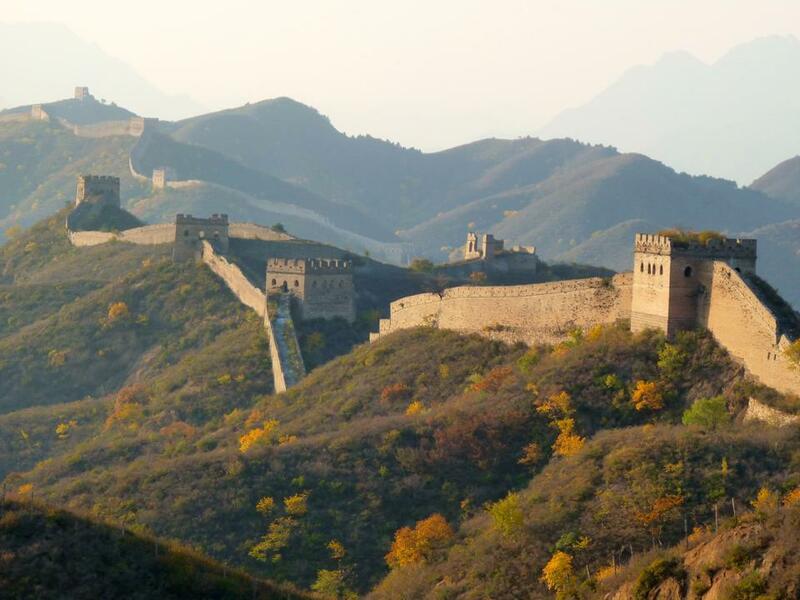 Today I’m meeting the tour leaders and 26 other people who are doing this Great Wall of China trek at Heathrow. My flight leaves at 5pm and tomorrow I will arrive in Beijing at around 17.30 local time (7 hours ahead). 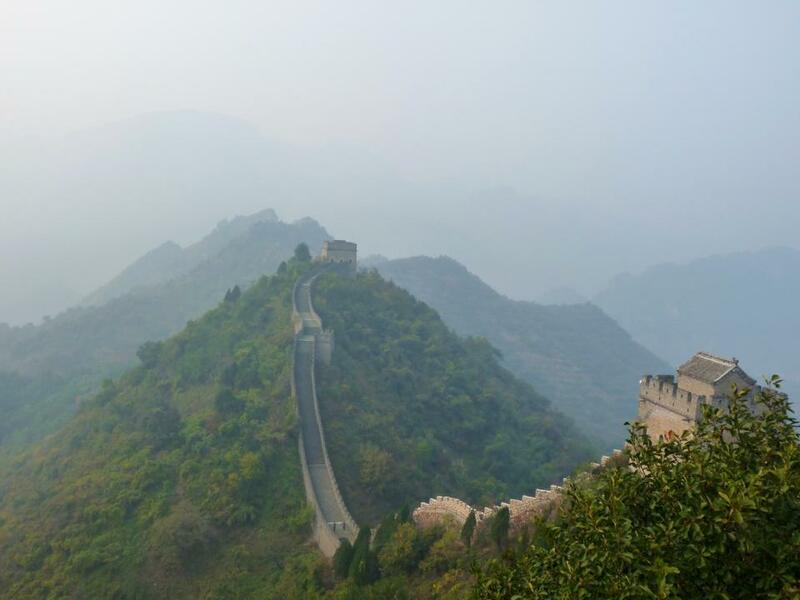 The next morning I will have a birthday with a difference as we catch our first glimpse of the Great Wall and take our first steep steps. Wish me luck – I’m going to need it!